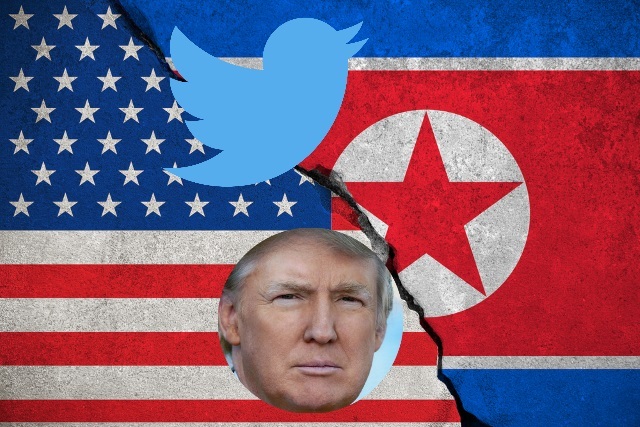 Why hasn't Twitter banned Trump or deleted his provocative tweets about North Korea? Donald Trump has been a divisive character for many years, and this trend that has continued with his presidency. On Twitter, his unique approach to dealing with world issues and global leaders has caused, to varying degrees, amusement, disgust and horror. In particular, his recent handling of North Korea has raised concern. His continual references to Kim Jong-un as Little Rocket Man, and his suggestion that the leader and Foreign Minister Ri Yong Ho "won't be around much longer" and that the US may have "no choice but to totally destroy" North Korea has been seen by the Asian country as "a clear declaration of war". People are asking why Twitter has not taken action against such naked threats on its platform. Now the company has spoken out, explaining that the "newsworthiness" of Trump's tweets is why they have been left untouched. The war of words between Trump and Kim Jong-un has been escalating for some time, and the North Korean leader has threatened to shoot down US aircraft even if they are not in North Korean airspace. There is concern among Twitter users that Trump is being given something of a free ride. The suggestion is that if other Twitter users were to say similar things, it would be perceived as a threat of violence and Twitter would step in and either delete the tweets or ban the user. Twitter insists that it holds all users accountable to the same rules, but points out that the "newsworthiness" of a tweet is also taken into consideration. The company says that this policy has long been in place, but it has only been an internal policy. Now, in the interests of transparency, this will be made a public policy. Replies to the tweets suggest that Twitter is in fact not treating all accounts equally, and is demonstrating bias by permitting the US president to get away with saying things that would get other users banned. Others point out that Trump's tweets are a direct violation of Twitter policies about making threats.